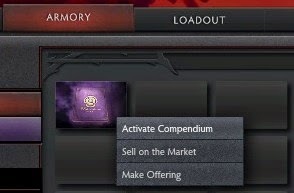 After purchasing the TI4 Compendium, you have the option to activate it on your Steam profile or to trade it to a friend. BUY THE TI4 COMPENDIUM TODAY! If I activate the compendium now, will I get the rewards? hi i did activate my compendium exactley like your video and then i buy 9.99 $ the 2400 point booster that put me from the level 1 to the level 25 but the problem is that i didnt receive any think that steam is offering and confirming on the site like the match booster level up and the immortal treasure . I was like wtf ? have anyone get the same problem ???? and what is the solution ?